It was 34oC when I left Perth and it's 18oC when I arrive in Tasmania. I'll be complaining about the cold next. The little girls and their Mum arrive two days later. 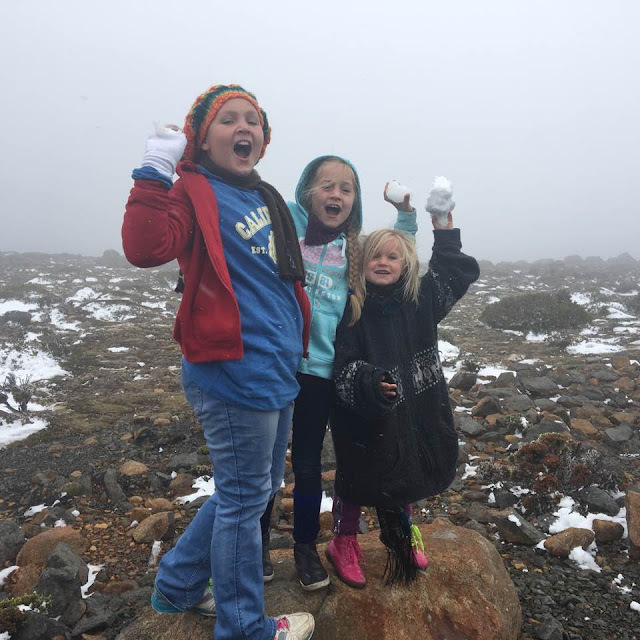 When they wake up in the morning, there's snow on the mountain.They are positively thrilled. I don't think the youngest, aged five, has ever seen it. They play in it, they taste it and come back red -cheeked and very excited. It could be a white Christmas yet. Youngest son has decided to delay his departure until after Christmas and the oldest, with his little family, will be arriving tomorrow. For a few days the house will be crowded with music, laughter and chaos. Strange that. I always thought it was a bit like Brigadoon for my mother -in -law when the whole family descended for a day or two and then scattered again to lead their separate lives. Now it's happening to me. It seems that one minute you are complaining about the noise, the fighting and the mess, and the fact that you can never get into the bathroom. Then all of a sudden, it is silent and tidy and all you have is memories and maybe a few old school books, toys and mementos of these people whom you now hardly know. Some of them have beards, some have children and all have much too busy lives and you, once the centre of their universe, feel totally irrelevant. Obviously time to get a life. What was it now that I was doing before the children came? I'll get back to you on that when I remember what it was. Mind you, I could do with a couple of "Silent Nights, Holy Nights" after five months of being surrounded and outnumbered. Still, I should enjoy my family while I can, you never know when the opportunity to do so will come again.